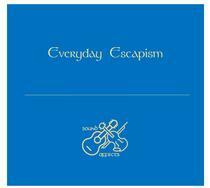 No online Dropbox with Sound Affects, aptly titled Everyday Escapism was manually dropped through my letterbox last week and I’ve listened to it daily since. The musky aroma of a wood burner. It’s aimlessly staring through the window of a gypsy caravan on a drizzling spring morning music, clasping a warm cup of tea in a chipped mug. Could be your mind is slightly hazed from a blinding night down the boozer, as you ponder raindrops trickling down the pane. Maybe the lively Day Breakers played, brazenly blasting their celebrated covers; you were in the midst of it all, dancing, but now, well, it’s taken its toll. Who’d thought you’d still be listening to two members of the band, Iggy Gould and Catherine York, on this fragile morning after? It’s a glass of red wine on an oak coffee table music; an evening with a newfound love, cuddling closely. For while you take caution choosing acoustic music for such a date, being there’s often a negative atmosphere about such tunes, and the last thing you want to project is the singer’s depressive besought about being dumped, or how terrible the world may seem to them. Allow me to suggest a CD from Sound Affects to suit the mood; Everyday Escapism. No online Dropbox here, aptly titled Everyday Escapism was manually dropped through my letterbox last week and I’ve listened to it daily since; it’s trundling along in a milk-float music, in the wee hours of a cool November morning too, it seems. Nick Drake could do this, no, not deliver milk, create positive acoustic sounds I mean, Cat Stevens and George Harrison in lighter temperaments too. And if neck hairs stand on end when Elbow throw those curtains wide, the sensation rises in Everyday Escapism, not in one gloriously memorable chorus, but as a consistent flow throughout the entire eleven original tunes. Iggy brings Guitar and banjo to the show, Cath predominantly violin and viola, with flute and ukulele also, together breathing authenticity into these Irish folk influenced tunes of mellowness; soothing but not lax, nor mushy. The writing is above adequate, nothing here to riddle a fragile mind, yet sublime enough to inspire and move you. It’s clear Iggy and Cath have poured heart and soul into this, and it shows. It’s the duo’s second album, Retrospective arriving in 2017, and Everyday Escapism is this year’s offering. There’s links to download from iTunes on the site, hard copies can be obtained at their live performances. Iggy and Cath show their flexibility here, while able to entertain an energetic crowd, here’s something personnel and reassuringly tranquil. A wonderful, ain’t-no-mountain-high-enough track, Million Miles kicks off the set, an ambient acoustic melody with the added emotion of Cath’s violin and occasion distant vocals blesses your ears and lets you know how the album is going to go down. Yet there’s no single tune I could pick out as a favourite, as it flows so nicely, it doesn’t distract from the ethos, doesn’t attempt to cram diverse styles, chuck experimental effects or borrow a repetitive sample, yet it never bores, rather leaves you yearning for more. Even tunes which may seem bleak by their very title, like Say Goodbye or Nothing Left to Lose, have uplifting perspectives to them, and nothing here is going to dampen your spirits, and I like that in an acoustic album. Of course, Nick Drake might’ve made a good milkman, who’s to say.